Rio de Janeiro is one of the most beautiful and spectacular cities in the world and it is no wonder that it is one of the most popular tourist destinations. Many people enjoy the city’s fantastic Carnival celebration which this usually occurs in February. The peak season is between December and March. The weather is sunny and can become quite hot. The only problem is accommodations during Carnival, so book your room at least a year in advance. If you want to travel at a time when the city is not as crowded and the temperatures are slightly cooler, April to May and October to November are the best times to visit Rio de Janeiro, Brazil. Rio de Janeiro Weather in January: The year kicks off with some heat in this lively Brazilian city with the average high temperature in January hitting 85°F (29°C). Nights are milder in temperature with the average low peaking at 74°F (23°C). In February, the hottest month of the year in Rio de Janeiro, the low temperature average retains its mild weather and holds steady at 74°F (23°C). Meanwhile, the average high temperature gets a small 1-degree bump up to 86°F (30°C). The heat definitely matches the atmosphere with Carnival fever hitting Rio during this time of the year. March fares a little better weather wise with the high temperature average falling back to 85°F (29°C). The low temperature average remains at 74°F (23°C) for the third month running. In April, there is a 3-degree drop in temperature for both the average high and average low temperatures. With the decrease, the high temperature measures in at 82°F (28°C) while the low temperature is at 71°F (22°C). Rio de Janeiro Weather in May: The downward trend in temperature continues in May with the average low and average high temperatures measuring in at 69°F (20°C) and 80°F (26°C). June brings mild temperatures to Rio with the average low temperature decreasing to a cool 66°F (19°C). The average high temperature is also nice and mild at 77°F (25°C). With such temperate weather, this is a fantastic month of the year to head out and explore the best sights in the city. In July, Rio experiences its coolest temperatures annually. The average low temperature sinks to 65°F (18°C) while the average high temperature hovers at 76°F (25°C). August sees temperatures warming up again though the general climate still stays quite cool. The average high temperature sees a 2-degree increase to 78°F (26°C), while the average low temperature rises to 66°F (19°C). Rio de Janeiro Weather in September: It’s a great month to be out and about in Rio with temperatures nice and cool in the city for September. Although the weather is still nice and manageable with the average high temperature falling to 77°F (25°C), the average low temperature sees small increase to 67°F (19°C). In October, the crowds thin out and the weather stays wonderful making it one of the greatest months to visit Rio. The average low temperature and the average high temperature measure in at 68°F (20°C) and 79°F (26°C) respectively. November brings warmer temperatures to town with the low temperature average rising by 3 degrees to 71°F (21°C). Meanwhile, the high temperature average increases by 2 degrees to 81°F (27°C). In December the average low temperature sees another small increase to 72°F (22°C). On the other hand, the average high temperature sees a more substantial increase to 84°F (29°C). 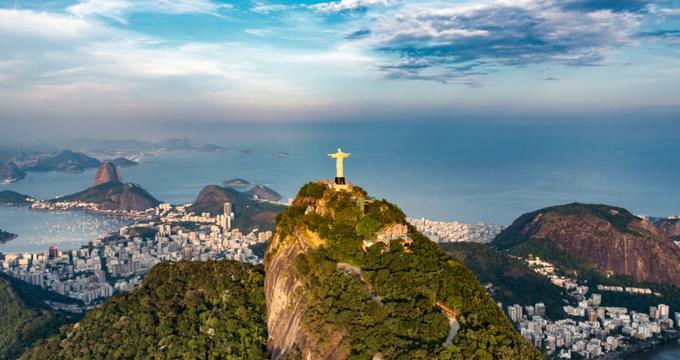 Step into a world of shimmy-inducing samba beats and stunning panoramic views at Rio de Janeiro where the lively spirit and party atmosphere seems to last all year long. There’s no argument that the best time of the year to visit is in February when Carnival light’s up the town and brings the best of the best to town when it comes to street performances, parades, parties and balls. January is also a great time of the year to come to catch Reveillon, one of the top New Year’s Eve parties in the world. 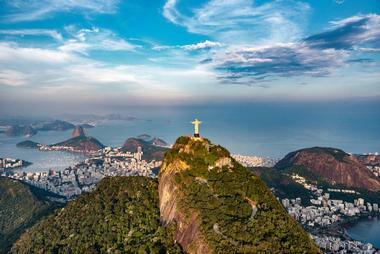 When it comes to sightseeing, the ideal time to visit this city of Brazil is between June and September. To avoid the crowds and enjoy mild weather, October through November is a great time to come by. The Antonio Carlos Jobin Airport is located 12 miles from downtown Rio. There are several ways to get into the city. The Bus Rapid Transport (BRT) system is a fast way because it uses exclusive lanes on its way into the city. There are two other kinds of buses that serve the airport: there are six “Special Buses” and four “Standard Buses.” The closest Metro station to the airport is the Vicente de Carvalho on line two: it is necessary to use the BRT between this station and the airport. 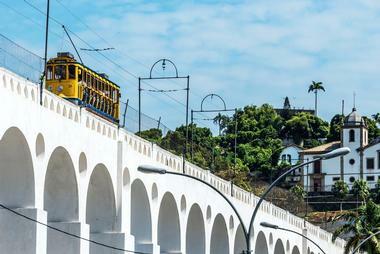 Buses and taxis are the best way to get from the Santos Dumont Airport to your hotel. 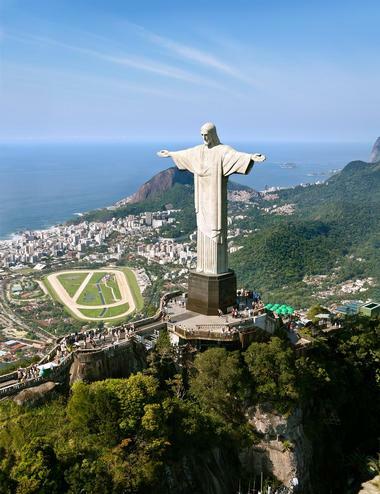 Rio de Janeiro is a huge and sprawling city and it can be daunting for the first time visitor. The Metro system in Rio is the easiest way to get around: most of the attractions are located in the area called Centro and the area called Zona Sul. The Metro consists of two lines: Line 1 goes north to downtown while Line 2 goes south from the Central station. Now there is an integrated Metro/Bus system which makes getting around even easier. The buses stick to the main streets and are surprisingly fast. To get a bus to stop, wave your hand at the driver. In addition to the great public transportation system, there are several other ways to get around Rio to explore its many sights. Some of the major attractions are within walking distance of each other including sights in the neighborhoods of Santa Teresa, Centro, Zona Sul, and Lapa. You might need public transportation or a taxi to get to some of these neighborhoods, but once you are there they are best explored on foot because of the many sights. To visit places that are too far to walk like Sugarloaf Mountain, it’s best to use a taxi; you should use a taxi if you’re traveling at night. You can also get around the city by car and by van. There are many different kinds of restaurants that you will find in Rio. Fine dining at hotel restaurants is at one end of the spectrum while small food stalls along the beaches are at the other end. Places called chopperias serve casual snacks and cold beer. Botequins are just slightly more upscale than chopperias. 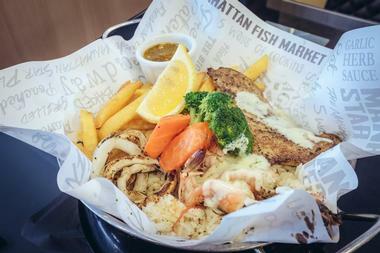 Some of the food that you will find include Bahian finger food, vegetarian sandwiches, barbecued prawns, and much more. In many of the various neighborhoods you will find expensive restaurants where you can celebrate a special occasion; and very simple restaurants serving sandwiches, tasty steaks, and many other choices. 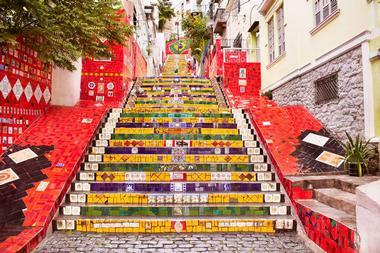 Rio is full of places to shop so shopaholics will have a great time exploring the many options. There are malls that are home to some of the most well-known brands in the world: the Botafogo Praia Shopping Center and the Rio Sul are two malls that are worth exploring. 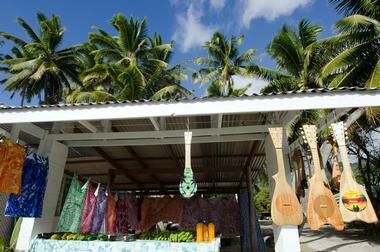 There are also boutique shops that sell things from high fashion to beach wear and accessories. Some of the areas you should explore are in the Centro area: the pedestrian streets around Rua Alfandega, Rua Buenos Aires, and Rua Uruguaiana are full of small shops packed side by side just waiting for visitors to browse. The landscape of Rio is made up of beaches, oceans, mountains, and valleys. The landscape has partly been responsible for the formation of the four zones that make up Rio: Zona Norte or North, Centro or Central, Zona Oeste or West, and Zona Sul, or South. The Zona Norte will be of least interest to the visitor: here are the Maracana Stadium, the airport, and many industries. The Zona Oeste is made up of some of the poorest and some of the wealthiest neighborhoods in Rio. Centro is home to many tourist attractions while the famous beaches of Copacabana and Ipanema are located in the Zona Sul. 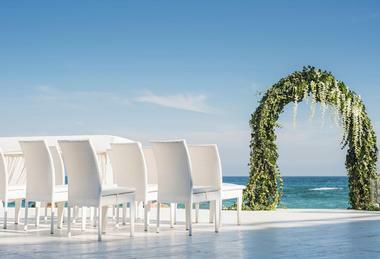 With its fabulous scenery, Rio is a great place to have a wedding. Foreigners can get married in Brazil: paperwork must be completed and submitted to the Civil Registry Office in the state where you will be married. You need to do this after you have stayed in Brazil for at least one month. After this you will be issued a marriage license. There are several resorts that are good wedding venues. These include the Hotel Caesar Park Ipanema, the Sofitel Rio de Janeiro Copacabana, and the Vila Gale Eco Resort De Angra. All three offer stunning views of the ocean. Rio is a big city, but it doesn’t offer a lot of variety in terms of different kinds of accommodations. There are not very many bed and breakfasts or boutique hotels except in the hilltop neighborhood of Santa Teresa. Most of the hotels in Ipanema and Copacabana are modern high rises built with similar designs and layouts. Hotels differ one from the other in the number of rooms, the room sizes, the amenities, and the views. The best room in a hotel that does not have ocean views can be far less expensive than hotels that have ocean views. 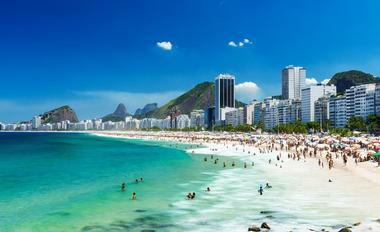 Most visitors stay in hotels in Copacabana, Ipanema, and Leblon.